9, Jalan Firma 2/1, Kawasan Perindustrian Tebrau 1, 81100 Johor Bahru, Johor, Malaysia. Topflow Engineering Sdn. Bhd. was established in 2009. The company is specializing in providing quality, reliable products and services for environmental pollution control. 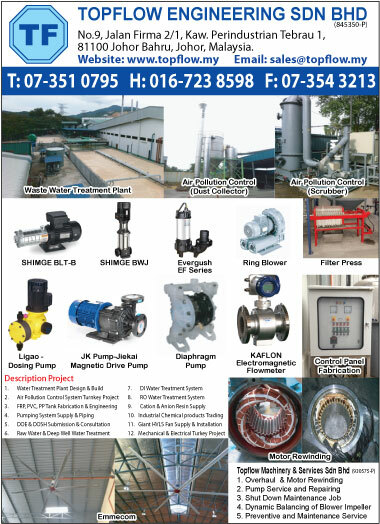 To provide one stop solution to our value customer, we also provide sales and marketing of various models of quality pumps and mechanical equipments. We work towards better understanding both with our customers and our principals. With the technical ability and market know how of our various principals, we are able to grow stably in the respective industries we serve. Together with the strong relationship with you, our customers and with our quality and reliable products and services, we are able to provide “One Stop Solutions” to your problems. In order to serve our customers more professionally, TOPFLOW Machinery & Services Sdn. Bhd. was established in 2011, the company is mainly concentrated on pumps repairing & service, CNC & conventional machine troubleshooting, machine overhaul & recondition and lock & relocation machine. TOPFLOW motto is to assist you to our best ability “PROVIDING ONE STOP SOLUTIONS”. This website shows the various ranges of products & services in our range. We are sure these will serve you to the best of their ability if used correctly. Detailed information will be readily available to you at your request so please do not hesitate to contact us.